Soon we will be facing a new year. For a lot of us this may be a new chance on life, an opportunity to do something different. May I suggest the art journal or what's also called the visual journal? Unlike scrap-booking, this journal goes into your inner person for expression through art and the written word. I started journaling when I got breast cancer. I was seeing a therapist (and I still do) who specialized in treating cancer patients. One bit of advice she gave me was to start a journal. "It will be good for you to get all your thoughts on paper," she said. 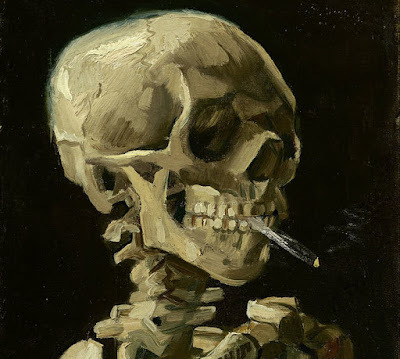 Well, being an artist, I took the process one step-further. 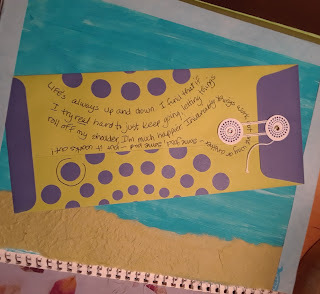 I added art, my own and collage, along with my written thoughts. The experience kick-started my way back to health. As most of you know, I had a 50/50 chance of surviving (I'm now out 12 years). I followed all the protocols, the diets, the therapy--both mind and physical. With all that, I still consider myself lucky. Some folks aren't as blessed as I. What helped immensely through this journey was my journal. 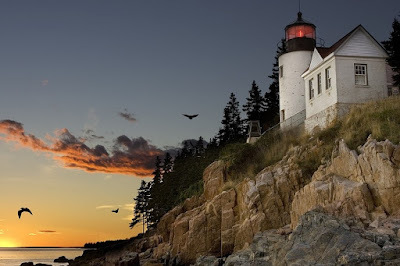 It was a place I could cry out my fears, my worries, my discomforts. It was also a place for me to pray, to learn more about me, to celebrate the life I had/have, no matter how long or short it will be. Let me begin by telling you that getting cancer can be one of the loneliest events of your life. Some people literally drop out of your life. I don't know if they are scared to get the disease or just don't know what to say (how 'bout, "Tell me about your day, was it harder or easier than what you expected?" There's always something neutral you can discuss). Then there are others who are gracious and wonderful who visit you. I was blessed, I had lots of visits. Another idea is sending cards. I received a card from someone everyday--really-- everyday. Am I lucky or what! All of these kindnesses were so welcomed, lifting my day and hopes. Despite all these blessings, every night in the darkness of my bedroom, the creepy monsters of fear and despair would inch their way into my thoughts, leaving me totally alone with unreasonable horror. As crazy as this may sound, my journaling helped because my scared inner self was able to express all the crud. Slowly, the loneliness got better--I was able to kick those buggers out of my nightly thoughts--and most of all, I began to get stronger. My writing, art and collaging took off. I found myself working on my journal most days and it was wonderful. Journaling also gave me the freedom to be creative about my own life and was the early genius of a whole new career. into art and teaching. There is something calming about journaling. For one, it's private. Today I share my journals but in the past they were vaulted in my closet, not to be touched or looked upon by anyone, even my closest friend, my husband. It was my space and only mine. This process was working for me so well, I asked my therapist if we could form a journaling group with fellow cancer patients. So for a couple of years, I held a monthly class at St. Vincent's Hospital where students came in with a sketchbook. I would supply the rest--from pens/pencils, inks, watercolor, brushes, collage materials to create their own journal. And WOW what a new experience. 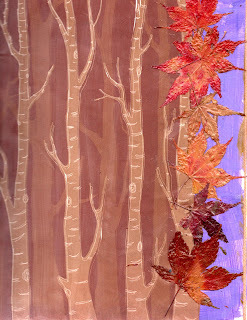 Not only was I reinforcing my own process, I was seeing lots of different developments right before my eyes. Yes, some of the students passed away. Some cancers are incurable and even when you have a fairly good chance, stuff happens. 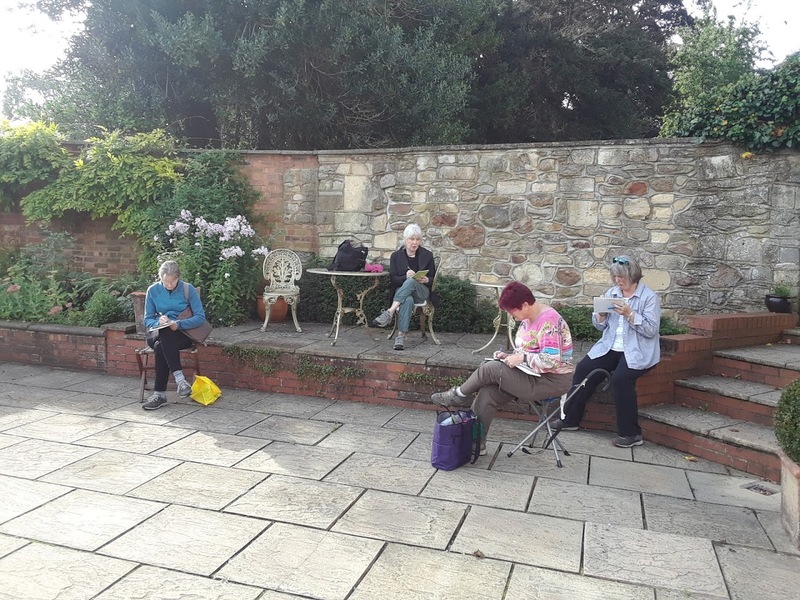 But at least, these gals had a great time journaling along the way. One student in particular, who is still alive and kicking, was very angry she had come down with cancer. Her journal was filled with blacks and reds and dark words. Additionally, she was reckoning with more than just cancer, but a lifetime of hurt. As time went on, her journal illuminated with great art, collage and a momentous collection of poetry and prose. It was a miracle. 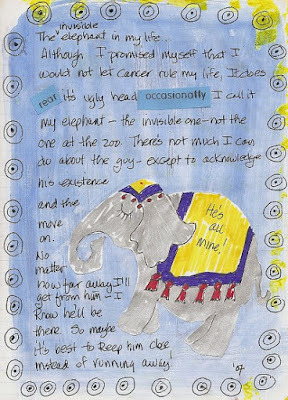 Obviously, you don't have to get sick to appreciate the world of journaling. And you can do it anywhere: at home, on the road, with friends or simply where your heart decides. As most of you know, I take students on annual travel sketching trips and we all thoroughly enjoy capturing the moment outside, even in the rain! There's something to be said about drawing a scene that a camera can't pick up: the wind, the sound of children playing, cars passing by, birds chirping and even a cow mooing if she's your subject.There's also something going on. And with sketches and words, we celebrate our travels. To this day, I still pick up my visual journal and draw, write and cut found items. It brings me a lot of joy. So I'd like to mention that this coming year in 2018, I will holding a Visual Journaling workshop in my studio on February 17th. The new catalog has just be published and you can see lots of other workshops offered. I am wishing you all a wonderful year in 2018. Thank you for being my student! Classes begin the first week of January. Go to website for descriptive listing of classes. If we think our movies and television shows are bad and grisly, get a load of this stuff done by some of the greatest. Warning: some of this is not for the faint of heart. It's all very maddening. Let's start with a mild one. 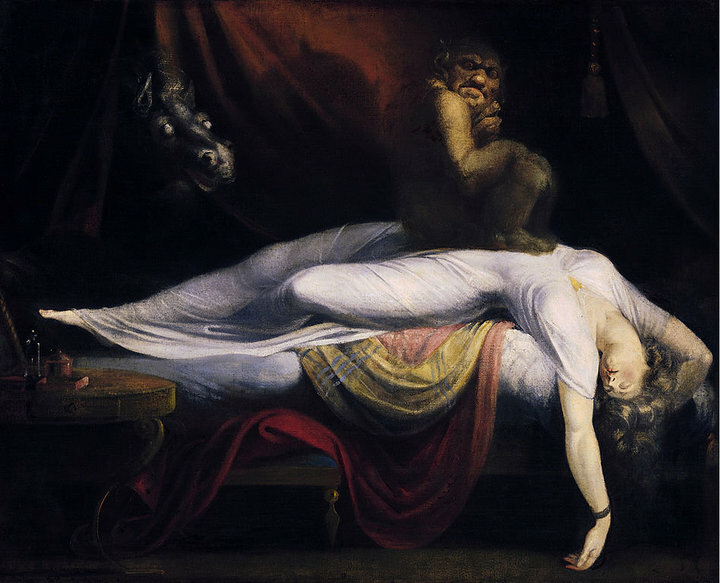 Now I've had some scary dreams, but this one takes the cake. Look at that demon. Remember not to call ole Saturn over to watch your first born! Pretty creepy. I've seen this one up close and personal. Even worse in real life. Considered very famous! It covers approximately 7ft x 12ft. 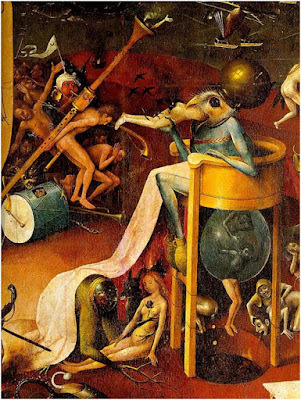 What was in Bosch's head? This is not "beam me up Scotty." Something's gone horribly wrong. These are not folks you want over for dinner. 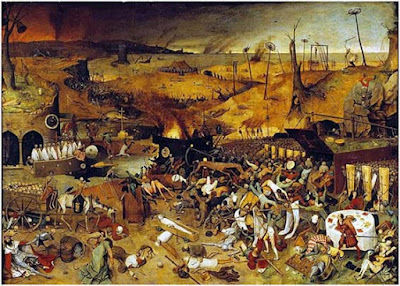 Army of skeletons attacking peasants. 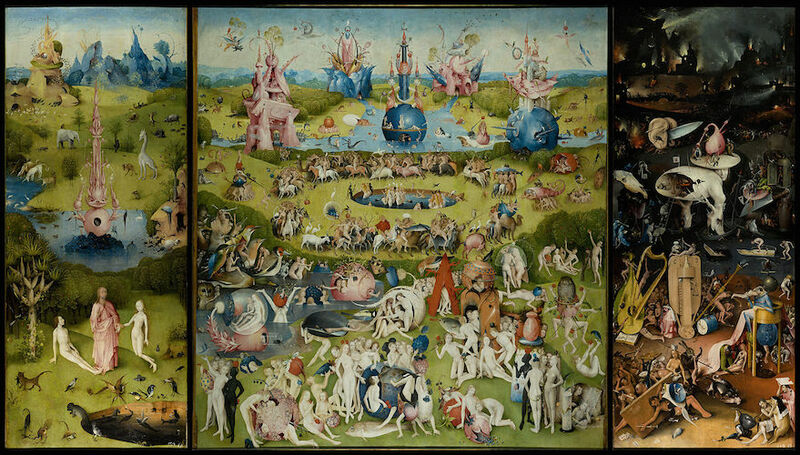 I've also seen this one in person and you find yourself mesmerize. Every inch is incredulous. 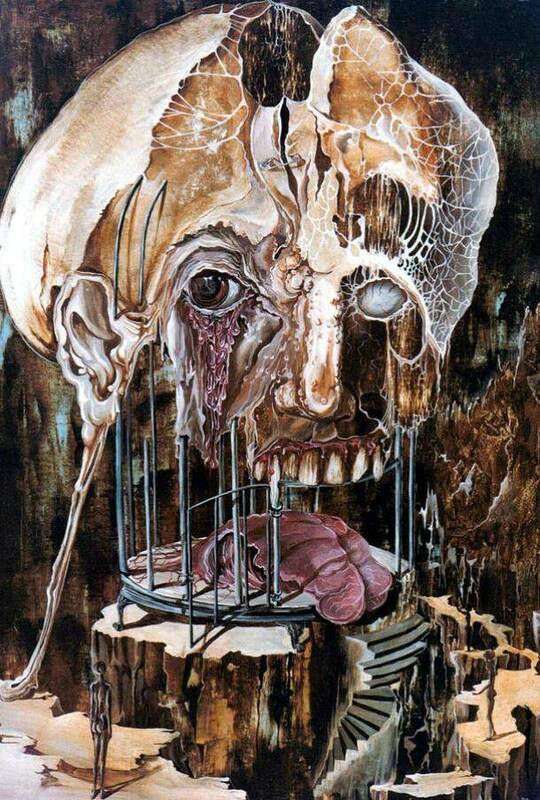 This is how my head feels when I have had too many glasses of my favorite vino. Oh it hurts so much. So when you feel our generation's media is getting out of hand, just remember, there's been awful, weird people before us! Just over two weeks ago we were visiting Ireland and England. 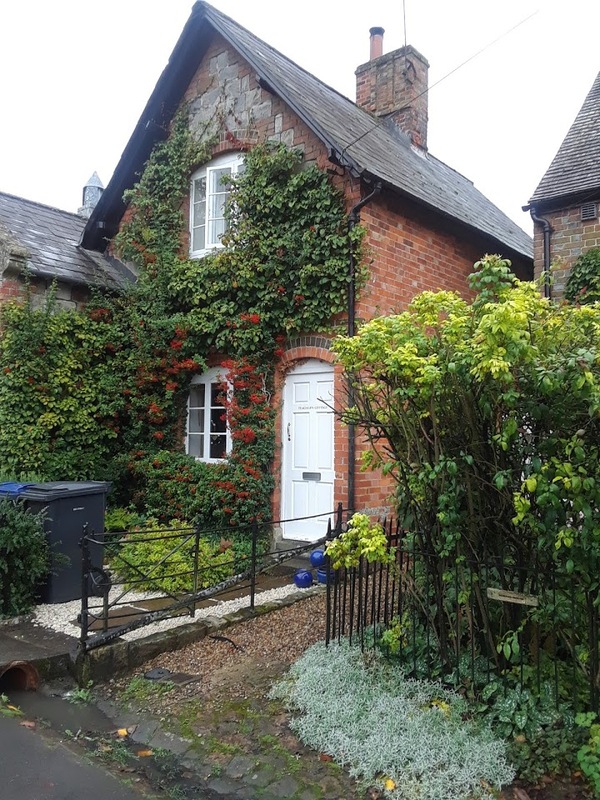 The Glastonbury Studios' sketching trip to England included a fun-filled time in the market town of Marlborough. We had five students. 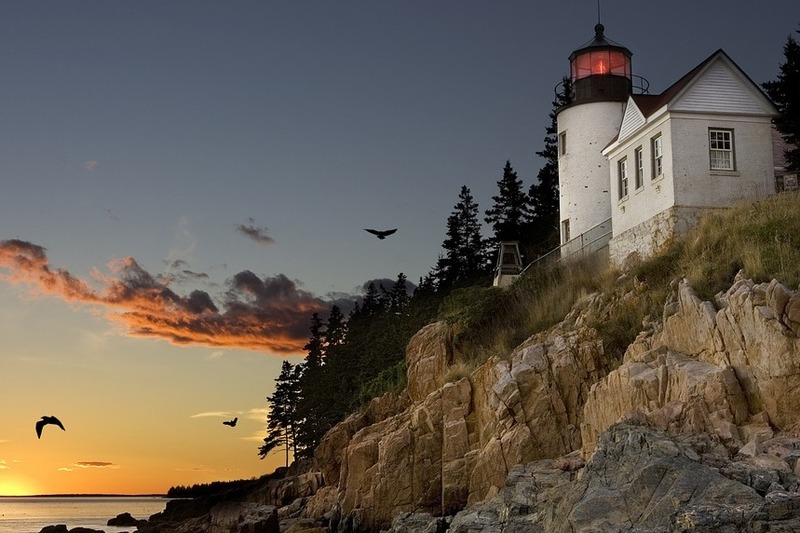 A favorite of King John, Marlborough has roots dating back over 5,000 years. After the Battle of Hastings in 1066, William the Conquerer spread his power and influence throughout England. 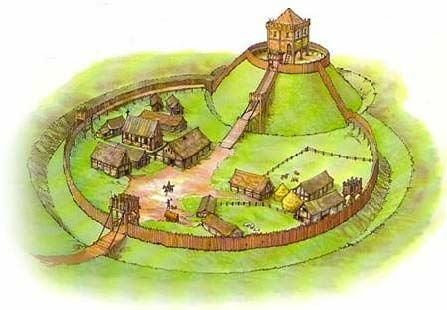 One such places was in Marlborough where a motte and bailey castle was built--somewhat like a wood fort situated on a raised mound and surrounded by a ditch. Interestingly the mound on which this castle was built is actually a burial mound dating back to 2400 BC. There is a legend that Merlin was buried there and it was called Merlin's Borough, thus the name for Marlborough. The great part is that today the mound stands inside Marlborough College and we were able to climb it (64 feet high) and stand on top of nearly 5,000 years of history. Along with its great history, Marlborough is a paradise of old relic buildings and pathways, a lovely river park, lots of shopping and great sketching opportunities. Just outside the town, you can find wonderful walking trails that can lead to the Ridgeway, built when England had a land bridge to the continent. St. Peter and Paul, a favorite for King Charles. Lots of shops and eateries. Housing along the river and park. 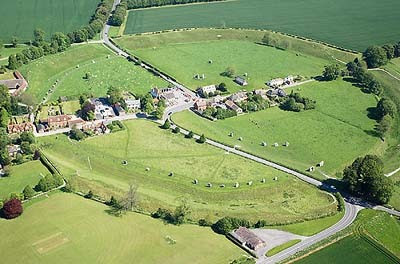 As always, I hired a van to take us to the little village of Avebury. 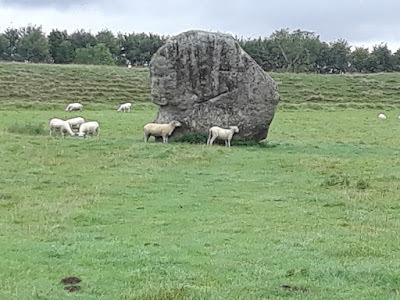 Unbeknownst to a lot of people, Avebury is far better than its top "competitor," Stonehenge. For one, it's less crowded. 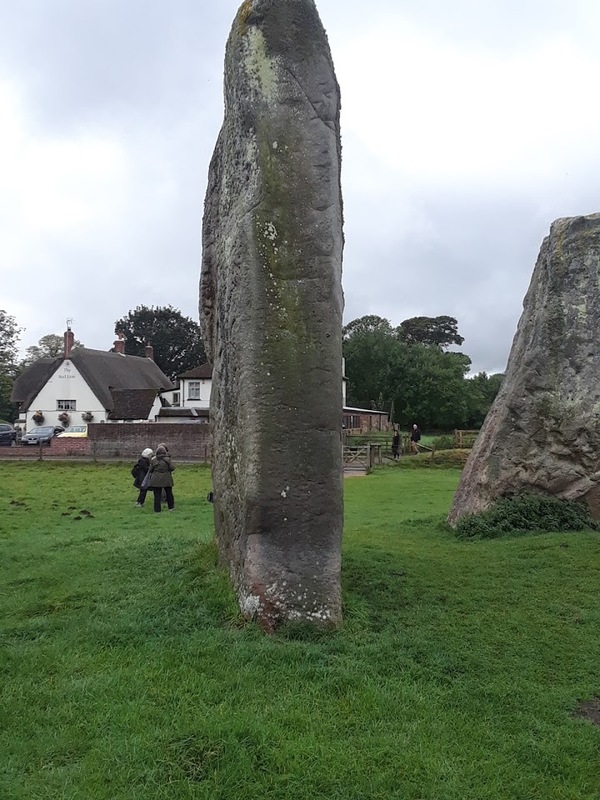 Secondly you can walk right up to the massive stones and thirdly, it's far easier to sketch because you can get up so close and personal. Plus, there are sheep all over the grounds. But no matter what time of year we go to Avebury, it's always raining. So we always have to do a quick sketch and move on! The gift shop that oozes with history. If you want to sketch sheep, Avebury is the best place. You won't see this at Stonehenge. students' height with the stone. Of course, we had to jump on the local bus to take us to Chiseldon, where we usually stay in the Chiseldon House Hotel (no room in the inn this year because of a wedding). The interesting highlight of this trip was that we met a thatcher who was thatching a roof. We also went over to the hotel and they let us sketch their lovely courtyard. 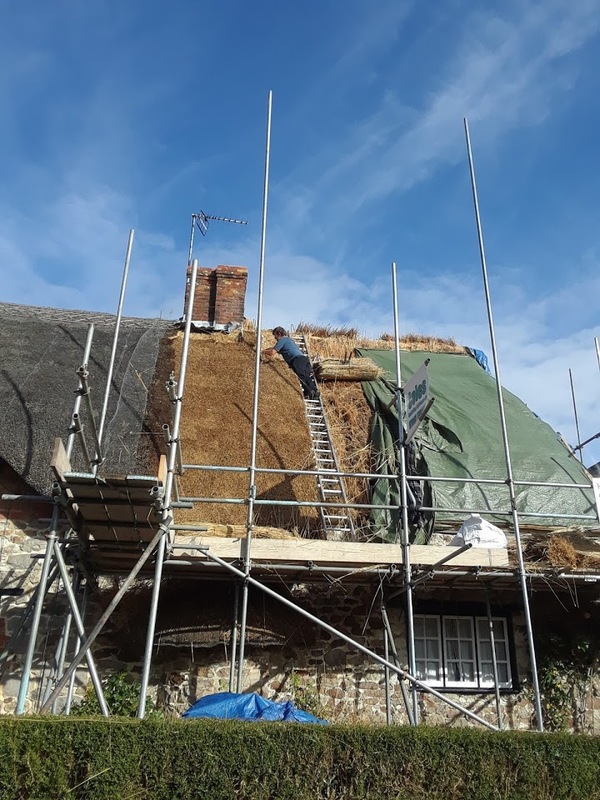 Watching a thatcher work in real time. Fascinating. The sketching gals hard at work. Another day and onto the van again. 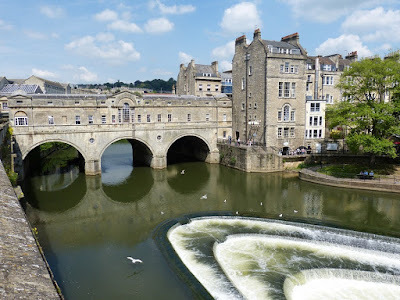 This time to visit the old villages of Lacock and Castle Combe. Both of them do not have power lines or TV aerials on the streets/houses. So they are perfect places for films to be shot. Lacock has been home to Harry Potter and parts of Downtown Abbey. Castle Combe hosted Iron Horse, Dr. Doolittle, Stardust and parts for TV programs, such as Robin Hood and Poirot. So there's a tale to tell on this day. We pretty much got to see most of each village, but really didn't have much time to sketch because of the rain. 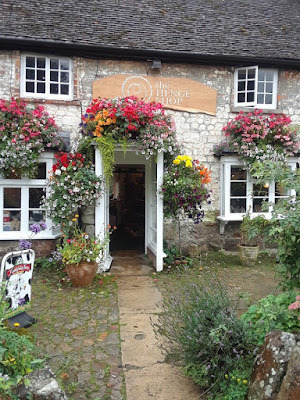 So instead we were able to visit the Lacock's bakery, church and the oldest licensed pub in the kingdom. The George Inn. While warming up in the pub, we heard a story about the original fireplace (which my husband looked up and found to only be partially true) by the owner. All I can say is that it made for extra entertainment, while enjoying our warm drinks. I'm just in love with the stone work through this area. Notice how worn the front stoop is. 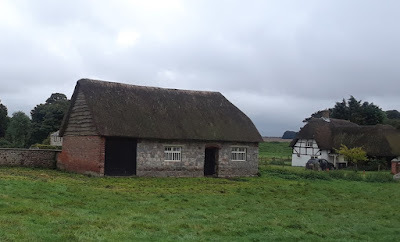 A side shot of a typical Lacock house. We only had a few minutes before it started to rain and I mean rain. Fortunately, we found a wonderful little inn (above) that gave us shelter. Then they served us a scrumptious cream tea (tea and scones with clotted cream and strawberry jam) in the lobby to warm our shivering bodies. another era, especially when there are no cars! 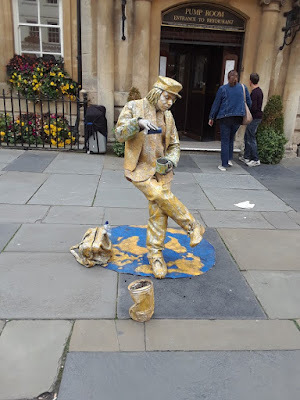 Wow, I've been to Bath over a dozen times and I still see or experience something new! We got to the city by 9 a.m. and were able to grab a bench in the courtyard before the Roman Bath/Pump Room complex and the Bath Abbey. 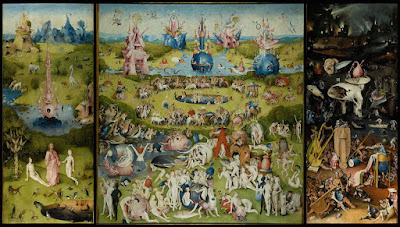 It was sort of like being in heaven. The crowds hadn't come in yet, the sun was shining on us (yay) and in the distance you could hear an opera singer whose voice drifted to where we were sitting to lift up our souls. Bath is known for street entertainers including sculptors, artist and dancers. Always something new! We visited two spots. 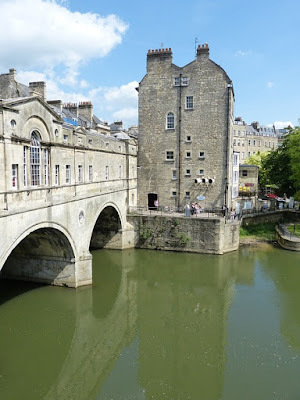 The courtyard and the Pulteney Bridge, which is similar to the Ponte Vecchio (old bridge) in Florence, Italy. Built during our revolution, the bridge is populated with several small shops. My favorite being the Bath Stamp and Coin Shop. 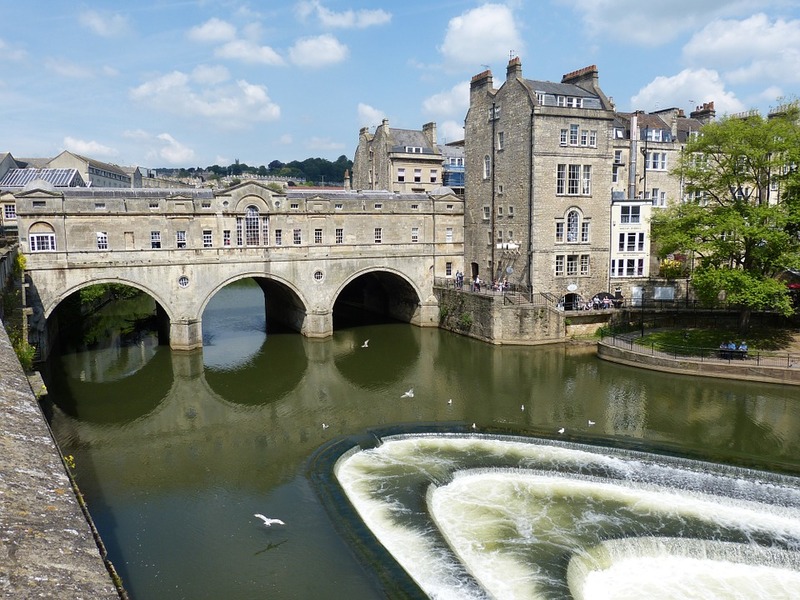 Back in 2000, we learned that the first stamp originated from Bath. We also were able to collect a goodly amount of old Roman coins (usually found on the old trails) and letters written, sent and delivered before stamps. While their inventory is limited these days, it was still a great place to stop to "ooh and aah. " Amazing balancing act. He even had water pouring onto a cup. Here's another field trip that blows me away. About 30 miles south of Marlborough, the city of Salisbury has the tallest steeple in England, rising from the famous Salisbury Cathedral. An added bonus is that one of the original copies of the Magna Carta is on display in the chapter room. I still get the shivers when I see it. attracts my attention to the detailed carving, especially the pillow. So that covers a few of the many pictures we took and the places we visited. Next outing will be Boston to Quebec in September 2018. We will draw then paint a subject every two weeks (pencil and acrylic paint). Final week will be a special project. All studio workshops are from 10 a.m. to 4 p.m. Includes supplies and lunch. The cost is $85. Class size is limited to nine students. Pre-registration is required. Only payment reserves your seat. Whichever watercolor medium you are using: paint, watercolor pencils, markers or even watered-down acrylic paint, you need to be careful of what papers you buy. When I started out in fine arts, of course I would buy the least expensive because I didn’t want to invest too much money into something I may hate. Seems to make sense. Except when you are using bad materials, you often have bad results. 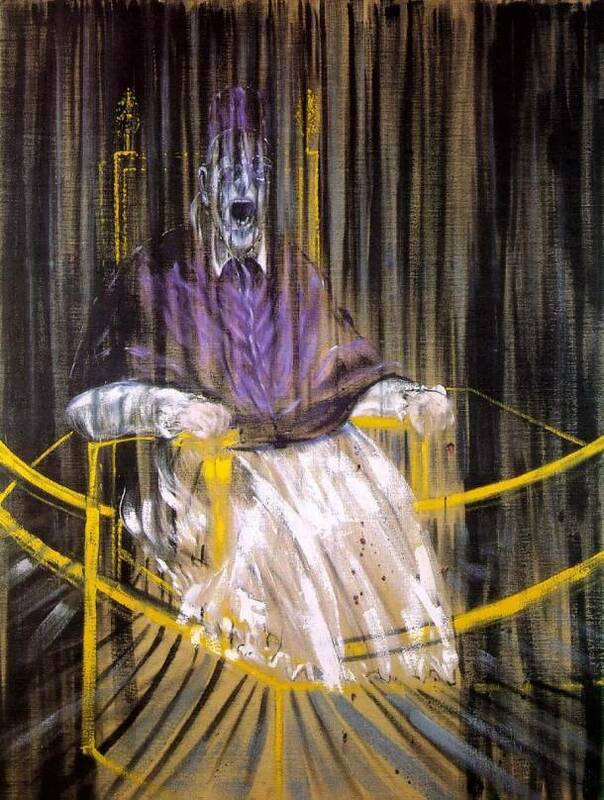 As a teacher once said, "A bad painting is either the artist or the materials." Hmmm. As a case in point, I had a teacher who recommended Strathmore watercolor paper, what I now call wood-pulp paper. I was new to watercolor, so I went out and bought the stuff. 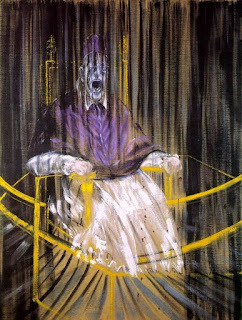 But no matter how hard I tried, I never got the paint to look like anything I saw in magazines or books. The paint literally just sat on top of the paper, never really penetrating it. Then, I took a weekend workshop on watercolor painting. Fortunately, the instructor supplied the materials (something I truly appreciate). This is where I learned about using the right paper for the right job. It's best to use 100% cotton, not the stuff that's made from trees and/or other materials. The entire process changed for me. Suddenly I witnessed watercolor pouring and blending over the paper with ease. It was wonderful. 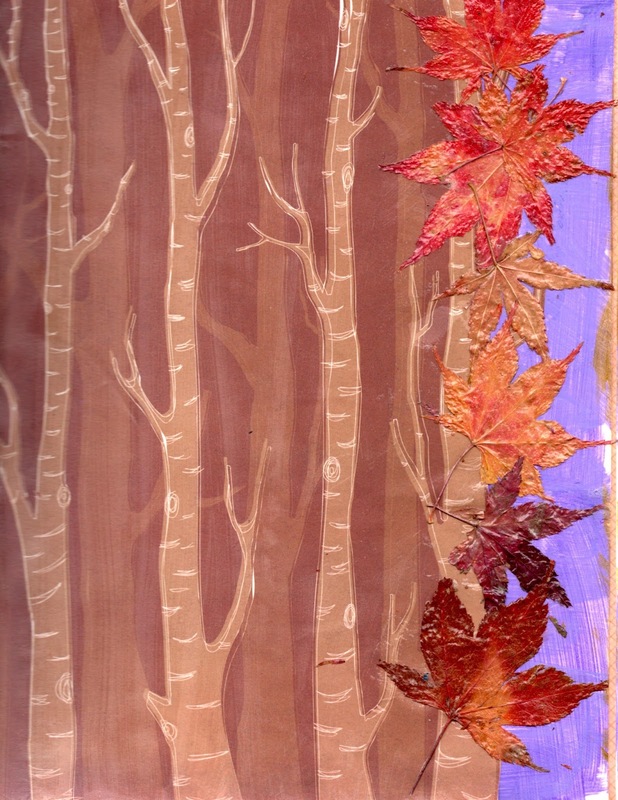 Below is an example of how watercolor paint reacts on wood pulp paper and cotton paper. 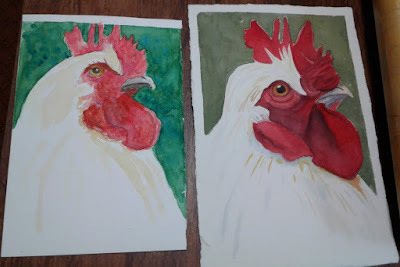 Notice the rooster painted on the left is on the Strathmore paper, while the one of the right is 100% cotton. It makes a difference. So, here's my best recommendation: don’t buy the cheap stuff. And most importantly, if you are using a wet medium, your paper needs to somewhat thick and tough. Below you will find a chart for a variety of papers. All of the above paper companies are fine. 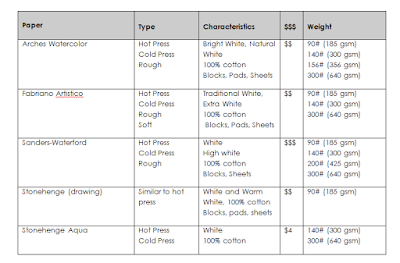 I use them all; my favorite is Sanders-Waterford from England, but Arches (France) and Fabriano (Italy) are good as well. Stonehenge paper is wonderful. I use it for my colored pencils but have found it to be great for water-soluble pencils as well. In fact, Stonehenge has just come out with their "aqua" brand specifically for water media. All good artist quality paper is made from 100% cotton because of its strength and longevity. There's a belief that the paper will last one year equal to the amount of cotton in the paper. Thus, good paper should last 100 years. There's evidence regarding this with the preservation of many papers from our human history. By the way, there are some papers on the market that have only 25% cotton that I like, especially for sketching. I often use Fabriano studio paper and Pentalic's Nature Sketching sketchbook, both of which have 25% cotton. My rule of thumb is that I don't spend a lot of money for sketching paper--it's not usually for a final, frameable project. Beside the fiber content of your paper, you should always buy paper that is acid free which may not be the case with wood pulp paper. Let me tell you why. I once spend hours on a colored pencil project using newsprint paper. Today that lovely drawing has not only yellowed, but the paper is also beginning to disintegrate (another early days mistake). The surface of your paper is a major consideration as well. You can get cold press, which is a bit more textured or bumpy as I refer to it or you can get hot press, which is a very smooth surface, also called plate. 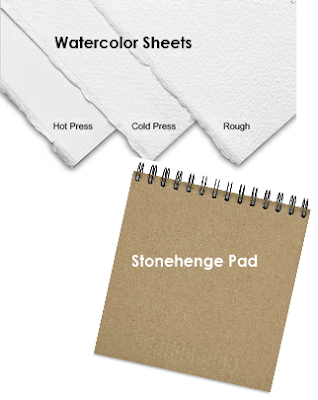 The cold press paper is used worldwide by watercolor artists. 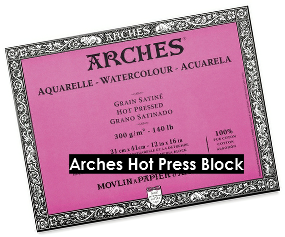 The hot press can be use for ink, watercolor wash, water-soluble pencils and even colored pencils. I love the hot press paper that Saunders-Waterford create. And one thing, there is the rough surface, which is exactly what is sounds like--rough, toothy, gritty. It's hard to work on (for me). As I said above when working with a wet medium, you need good sturdy paper. That's when paper weight comes in. You can buy paper of course as thin as your ordinary copy paper at 20# but I can assure you that if you try to use copy paper with watercolor, you'll have a wiggly, wobbly paper after you're done. Papers come in higher weights but what you want to hone in on is at least 90#. This is the least weight that can hold wet, but it will have to be stretched. In other words. wet paper taped down on all edges to a board to keep it from causing hills and valleys. The same is true for 140#. I often buy papers in blocks where the paper is pre-stretched and glue to the edges. I used to love stretching paper, but have found it easier just to buy the blocks. If you go higher than 140#, such as 156#, 200# and 300#, you'll find that you can eliminate the stretching, but I have to warn you, if you are going to use a lot of water on even the heavier papers, be warned, the paper can still ripple. In the end. I usually use 140# paper for my water-soluble pencil on hot press. I don't work on massive projects, so this combination really works for me. In recent years there have been two types of white watercolor paper introduced. Along with traditional white, you will see bright white or high white. The latter has such a brighter white that enhances vivid colors and brighter highlights. 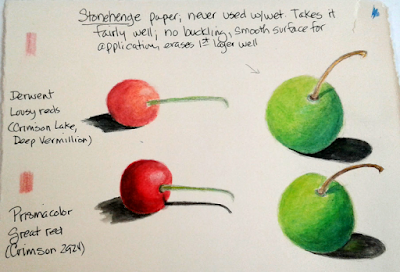 I did some experimenting this past spring while preparing for a workshop and I found that Stonehenge (drawing) lends itself nicely to water soluble pencils, as you can see below. The colors went down beautifully and wetting never caused a wrinkle. Having said that though, I do not believe this paper would tolerate heavy washes; that's where the Stonehenge Aqua would a better choice. 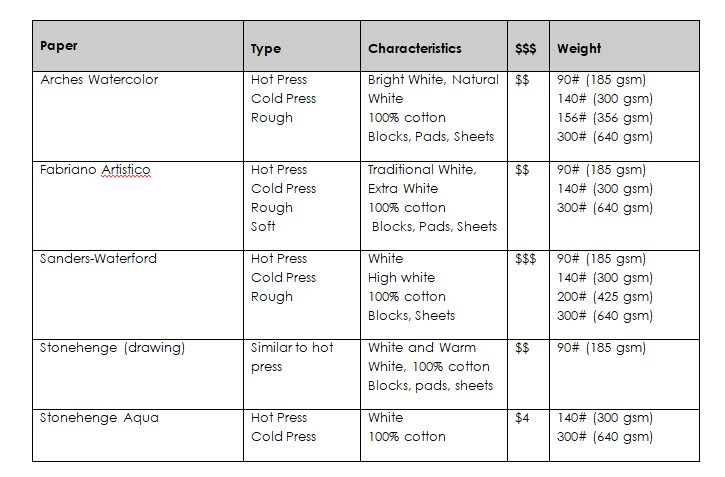 As I mentioned above, you can purchase a lot of watercolor paper products in pad form or what’s called block. That’s when several papers are glued together, all way round the edge to avoid stretching. Although if you use heavy watered washes, you’ll still experience buckling. The other way to purchase paper is by buying big sheets, usually 22” x 30”. I have a tendency to buy paper this way. I simply cut the paper to the size I want. Sometimes you can find real bargains on line, but generally, you can expect to pay five dollars or more per sheet. Don't be like me (in my early art career). Buy the best paper you can afford. There's simply no substitute for using the right tools for the right job.